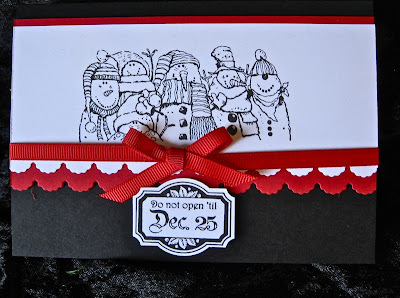 It's always nice to have a bit of humour and when I first saw the HOLIDAY LINEUP stamp set from Stampin' Up, I thought "What a fun set of stamps". I've used each of them for this set of 3 cards in the April Christmas Stamp A Stack , and kept the colours to a minimum. What could be more basic? Here are the cards and as you can see, quite a bit of variety can be achieved using a limited pallet. 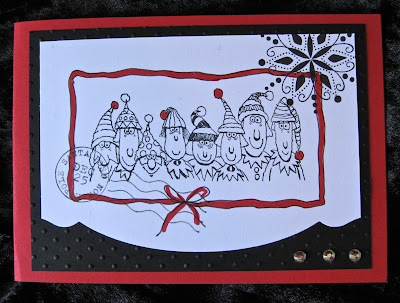 I've hand drawn the border twice using a BLACK Stampin' Write Marker and filled it in with the REAL RED MARKER. Then I selected a few highlight areas to colour in Red and added the postage stamp and snowflake stamps from the WINTER POST stamp set. Stampin' Up! have given us some EDGELITS DIES - wonderful little cutters that cut exactly where you want them to! And not only do you get one in the pack but a second delightfully shaped edge that I've used on the next card. that some of the old favs have to make way for new and exciting sets. The gorgeous greeting is from the HEARD FROM THE HEART stamp set. That's all for Christmas until June. I'll be away for most of May so no classes! Ann, thanks for the inspiration. 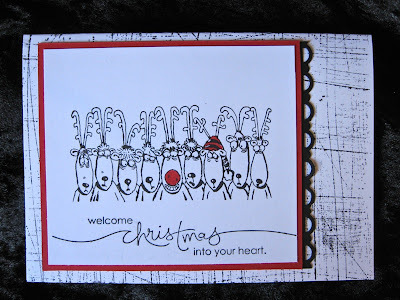 I have a big class of 30 ladies next week, and I wanted to do Xmas in July, but thought I have only 1 set of every xmas stamp. Then I remembered I had Holiday Lineup, which will work perfectly well. Three stamps to spread among the class.